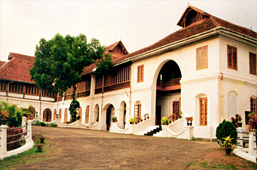 Mattancherry Palace or Dutch Palace was built by the Portuguese and gifted to Raja Veera Kerala Varma of Kochi. Constructed in the year 1557, the palace depicts the traditional Kerala art and architecture. The palace got the name Dutch Palace after the renovation works done by the Dutch in 1662. You can see here a double storey building in the form of a traditional ?Nalukettu? style with a central courtyard. In the courtyard, you can sight a temple of ?Pazhayannur Bhagavathi? and on either side of the palace, there are two temples dedicated to Lord Vishnu and Lord Shiva. Enter the palace and travel back to time. You can see here numerous mural paintings showcasing various incidents related to Hindu epics and Puranas. Also go through the portraits of Maharajahs, who ruled Kochi along with their ceremonial dresses, coins, weapons etc. The palace will be opened on all days except Fridays with a nominal entrance fee. Mattancherry Palace is placed around 10 km away from the Ernakulam town and railway station. You can make use of private and public transport available to reach there. The Cochin International Airport is located around 42 km away from the palace. 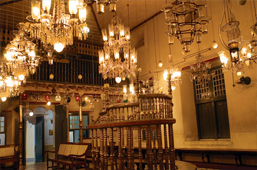 Jewish synagogue also known as Paradeshi Synagogue in Mattancherry, Ernakulam, is considered to be one of the oldest active synagogues in the Commonwealth of Nations. The synagogue was built in the year 1568 by the Malabari Jews (Cochin Jews), a well established trading commuity in Kerala. The synagogue was constructed adjacent to the Mattanchery Palace. In 1662, the Portuguese destroyed the synagogue and later it was reconstructed by the Dutch. The main entrance of the synagogue leads to a large main hall. You can sight here, large varieties of antique objects. The floors of the synagogue are made up of Ceramic tiles, which were brought from China. You can also see here copper plates of 4th century with Malayalam inscriptions. Jewish synagogue is around 10 km away from the Ernakulam town. You can travel by bus or taxi and if you are interested, you can also make use of the ferry. The synagogue will be opened on every days except Fridays, Saturdays and Jewish holidays and there is a nominal ticket fee for the visitors. Located at Fort Kochi this Protestant church was originally built by the Portuguese in 1510 AD and is believed to be the oldest church built by the Europeans in India. lt is here the remains of the inveterate traveler, Vasco da Gama were initially buried and 14 years later, his mortal remains were taken to Portugal. You can also see a Dutch cemetery near the church. The church has beautiful architecture. The roofs are timber framed and covered by tiles. You can find a stepped pinnacle on both sides of the facade. 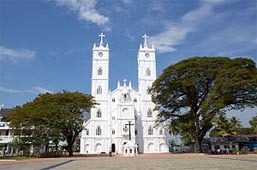 Fort Kochi The Roman Catholic Church situated close to St. Francis Church and is worth visiting. Some beautiful paintings can be seen here. ST. FRANCIS ASSISI CHURCH St.Francis Assissi church popularly knows as Naduvileppalli,the most beautiful and old church in Ernakulam city, the blend of Portuguese and Kerala style of architecture.The unique feature churche's roof is that the entire hyper bolic para bloid shell roof rests only on the centre pillars on the either sides.It has completed 179th year existence....Hundreds of people come here at odd times to sit in the quiteness of the church to commune with god. Fort Kochi- The Chinese Fishing nets that line the sea-front and exhibit a mechanical method of catching fish by local fishermen in Fort Kochi. 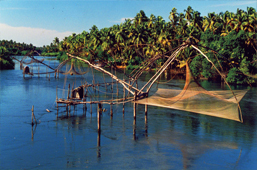 Chinese fishing nets is known as 'Cheenavala' in Malayalam. It is believed to be introduced in Kochi by Zheng He, the Chinese Explorer from the court of Kubla Khan. The Chinese nets are made up of teak wood and bamboo poles. Each with a 10 m height is used to be fixed on a beach. A cantilever with an attached net is then spread over an area of 20 meters. Set in the backdrop of Kochi backwaters and placed amidst the beautiful garden, the Bolgatty Palace in Kochi has now transformed into a most wanted Heritage hotel in Kerala. Originally built by the Dutch in 1774, the huge mansion is considered to be the oldest existing Dutch palace outside Holland. At times, it was the Dutch governor?s palace and later in 1909 it was let out to the British. Till independence, the palace served as the home for British governors and after that it was converted into a Heritage hotel by the state. Located in the Bolgatty Island, the Hotel Bolgatty Palace is a two-storey building with a huge lounge. This is a perfect retreat for honeymooners and the hotel provides exclusive honeymoon and lakefront cottages for them. Apart from this, the hotel is equipped with a mini golf course, swimming pool, Ayurvedic centre and daily Kathakali performances. 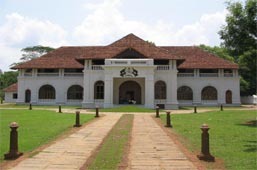 The palace is easily accessible from Ernakulam town. You can hire a taxi or can use the bus services available. You can also make use of the ferry services. 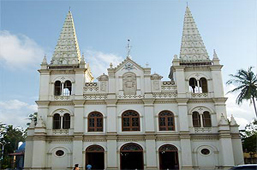 The Vallarpadam Church, popularly known as Basilica of Our Lady of Ransom, is a popular pilgrimage centre. Irrespective of cast and creed, people from all around the world make a visit to this divine place, to get the blessings of Mary, the Mother of Jesus. The local people here address ?Holy Mary? as ?Vallarpadathamma?. 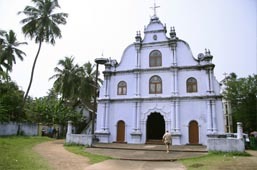 Considered to be one of the oldest European church, built by the Portuguese in India, the Vallarpadam church is located in the island Vallarpadam, around one kilometer away from the Ernakulam mainland. This church is considered to be the first church dedicated to the Holy Spirit. Considering its divinity, the church was declared as a major pilgrim centre by the government of India in the year 1951 and in 2002, the Kerala government declared it as a major tourists centre. The shrine got the status of ?Basilica? in the year 2004. You can sight a rosary park and a walkway in front of the church and here the sculptures and mysteries of faith are showcased. Be at Vallarpadam church during the month of September and you can witness, the famous Feast of Our Lady Vallarpadam. The feast is usually conducted every year from September 16 to 24. You can?t dare to miss a visit to the famous Hill Palace Museum while planning a trip to Ernakulam. Considered to be the first heritage museum and largest archeological museum in Kerala, the Hill Palace museum attracts tourists both domestic and international, with its splendid beauty and magnificent structure. 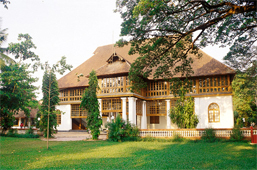 The palace was built in the year 1865 by the Maharajah of Cochin and spreads over an area of 52 acres. You can see here around 49 building with the traditional architectural style of Kerala. Inside the museum, you can sight around 14 categories of exhibit like crown, ornaments, weapons, coins, inscriptions, sculptures etc. The palace is also a shooting spot and the Malayalam movie ?Manichitrathazhu? was shot here. Along with the museum, the palace premises consist of a deer park, children?s park and also a splendid collection of rare medicinal plants. Roam around the palace premise and experience the green around. The museum is opened on every day except Mondays and you will have to collect an entry fee to visit the museum. The palace is around 12 km from the Ernakulam town and is easily accessible through public and private transport. 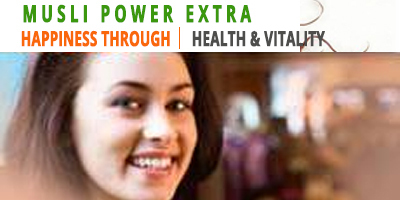 Timings: 9:00 hrs to 12:30 hrs and 14:00 hrs to 16:30 hrs. Closed on Mondays & National holidays. Admission : Rs. 10/- per adult; Rs. 5/- per child. Camera Rs. 20/- Video Camera Rs. 1000/- for photography. Willingdon Island is a beautiful man made Island in Kochi, surrounded by the Kochi backwaters. 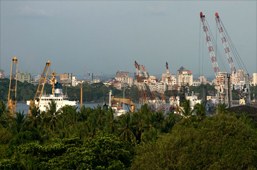 The island was formed in the year 1936 as part of the construction of modern Kochi Port. The Vembanad Lake was deepened to accommodate the new port and thus leading to the formation of the beautiful island. The name Willingdon came from the name of the then viceroy of India, Lord Willingdon, who commissioned the project. Now the gorgeous island is a link between Kochi and other sea ports of the world. You can see the headquarters of Southern Naval here and the island is also home to some of the best hotels and industrial offices of Kochi. You can simply have a walk through the less crowded roads of the island enjoying the beauty of the backwaters. To reach Willingdon Island, you can either travel by road or can choose the ferry service available. The Ernakulam Junction railway station is around 9 km away and the Cochin International airport is around 41 km away. Situated at Edappally 10 km on the National Highway from Eranakulam on the Alwaye route. Presents one hour light and sound spectacles of life-size sculptures in concrete, of the makers of Kerala history, together with the background music and commentary with glimpses of the vastness and diversity of Kerala's history over the centuries. 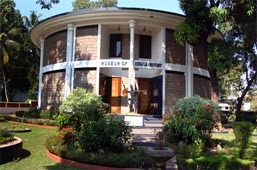 The centre for Visual Arts and Gallery Paintings & Sculptures is situated at Edappally about l0km from Emakulam and located next to Museum of Kerala History. It houses about two hundred original paintings of recognized Indian masters, both contemporary and of the past. There is also a large collection of modern sculptures in marble, bronze, granite etc. Timings: 10:00 hrs to 17:00 hrs. Admission: Rs.5- per adult and Rs. 3- per child/student. Mangalavanam-" The green lung of Kochi city"
The ecologically sensitive Magalavanam is safely tucked away behind the Ernakulam High Court. 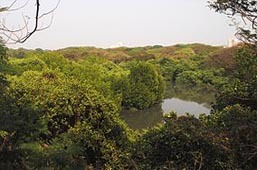 This evergreen forest land in the heart of Kochi is a green oasis for many migratory birds as a nesting ground. Visitors to Mangalavanam are captivated by the sheer variety of migratory birds that have nested atop the huge trees. Get a little closer and the birds fly away, leaving behind the eggs and newborns at the mercy of crows and kites. These birds are sensitive to the presence of human beings. Mangalavanam is the only existing green lung in Kochi city, offering a nesting ground for a vast variety of migratory birds and supporting many varieties of mangroves. As a source of oxygen, the rare eco-system in the heart of Kochi city, Mangalavanam has been keeping pollution under check. Thus, it supports to become rich resource for eco-tourism. Opposite Air India, M. G. Road, Eranakulam Exhibit regularly collection of paintings. KUMBALANGHI - ALL SET TO REACH OUT TO INTERNATIONAL TOURISTS Some time in August, Kumbalanghi, the first model village in the country, will play host to 80- odd high-end tourists from the United States. This visit is expected to cement the position of this village, on the city suburbs, as a much sought after tourist destination in the state. The tourist group will arrive in the luxury liner, Pacific Princess, and will spend a whole day in Kumbalanghi. "We have been taking small groups, but this is the first time a group this big is being taken there. Our effort has always been to promote Kumbalanghi as a typical Kerala village," said Mr. Unni Menon, branch manager of Travel Corporation of India who will be doing the ground handling for the cruise liner. Even while the tourist flow increased during the last couple of seasons, the village had not advanced much with respect to hospitality extended to high-end tourists. There is at present only one quality resort that can cater to high-end tourists, who may not be keen on home stays. Kumbalanghi now has around 10 home stays. The village panchayat and tourism coordination committee are encouraging residents to convert more homes to receive tourists.Foreign tourists mostly prefer houses with water frontage. So we have been getting enquiries from many such residents in the village. We issue forms through the District Tourism Promotion Council and guide them how to go about it. Once it is ready, the place will be listed in the tourism department's website, said Mr. M.P. Sivadathan, panchayat president. As part of the model tourism project, around 100 families in the village will be trained on traditional cuisine. The home stays will be the main window through which this will be popularized. Already, training sessions on country boats, hand -carved cot and art forms like thiruvathirakkali and kaikottikkali are common in the village. Another one being planned for Chavuttunadakom the traditional theatre art of the land.Equipping the local public in preserving their culture and showcasing it are important components of the model - tourism project that is being funded jointly by Union and State governments and United Nations Development programmes.